Tragic news from K2 on Saturday 7 July, 2018. Canadian climber Serge Dessureault is thought to have fallen to his death just below Houses’ Chimney or perhaps while rappelling down the Black Pyramid. He was climbing with fellow Quebecers Nathalie Fortin and Maurice Beausejour who are both safe. Fortin posted on Facebook that they had spent the night at Camp 2 for acclimatization purposes and planned to descend back to Base Camp to wait for a suitable summit weather window. Statement of Summit Karakoram Pakistan We stand with the family and friends of Serge Dessureault a great friend we lost today. As is usual with these tragedies, there are multiple versions of the incident emerging however, the common theme is that he fell. Serge Dessureault, 53, was a Montreal firefighter for almost 30 years and was the leader of the three-person Quebec K2 team. Dessureault wanted to be the first Quebecer to have climbed Everest and K2. He was stopped in 2016 by avalanche danger on K2. The two remaining members of the Quebec team have canceled their K2 expedition. Many of the off-record reports cite the use of old ropes on K2. I can share my 2014 experience where I saw a spider web of old ropes especial on the Black Pyramid. We were extremely careful, and double and tripled checked to clip into only the new ropes put in that season. The old ropes regardless of quality will rot and weaken after a season of exposure to weather and especially UV rays for the sun at that altitude. If you climb mountains or even read about climbing history, House’s Chimney is like the “old” Hillary Step on Everest but magnitudes of more difficulty in spite of the lower altitude. Free climbed by American Bob House in 1939, it is a 100’ shoulder width crack in a rock wall. 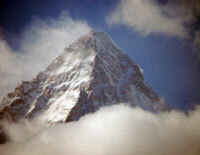 Over time, it has been determined to be the safest route to the higher flanks of K2. Some rate it at 5.6 without aid, but at 21,500’ it is a challenge regardless of the rating, or aid. There is an old “rope ladder” in the Chimney that some climbers will occasionally put a foot or hand on but most assume it is unstable and stem up the chimney with their jumar attached to a new fixed line. Going down is a simple rappel or abseil but care must be taken to rig the rappel device properly or a sudden fall will occur. The same warning applies on the Black Pyramid where four to ten rappels may be required depending on the season and skill of the climber. Any mistake can be deadly in this section as it is low 5th class rock but highly exposed with little forgiveness. These are two videos I made in this section 2014. By the sounds of things, the majority of the fixed ropes have been put in by a German Team, and when in place, were of pretty good quality, using more traditional static (very low stretch) Kernmantle rope, with only a few sections using the cheaper ‘Korean rope’. Korean rope is 3 strand braided nylon rope, which is cheap and light, but the quality suffers as a result (it’s often referred to as ‘Korean washing line’). It’s perfectly strong enough when it’s new, but it does get abraded as it runs over rock, and gets horribly twisted when you abseil on it. The “Korean Cord” is usually used on K2 but maybe not this year since Maddison Mountaineering was co-leading the rope fixing effort along with Seven Summits Treks and puts safety first on the list. Broad Peak Summit Attempt NOW! Andrzej Bargiel had wanted to acclimatize on GII but with the bad weather abandoned this is is now moving to K2 Base Camp. He wants to ski from the summit of K2. My sincere condolences to the family, friends, and teammates, and all of Quebec on their loss. Simply tragic. Sad news. Thank you Alan! In both the 1996 Everest disaster and the 2008 K2 disaster, delayed and wrong fixing of ropes (respectively) was an important (but not the only) factor that resulted in deaths. In 1996, absence of ropes on The Hillary Step caused traffic jam and delays (while the ropes were being fixed later); whereas in 2008, beneath The Bottleneck, the ropes were fixed at the wrong place and have to be removed and taken further up to make way for the climbers which also resulted in sufficient wastage of time. 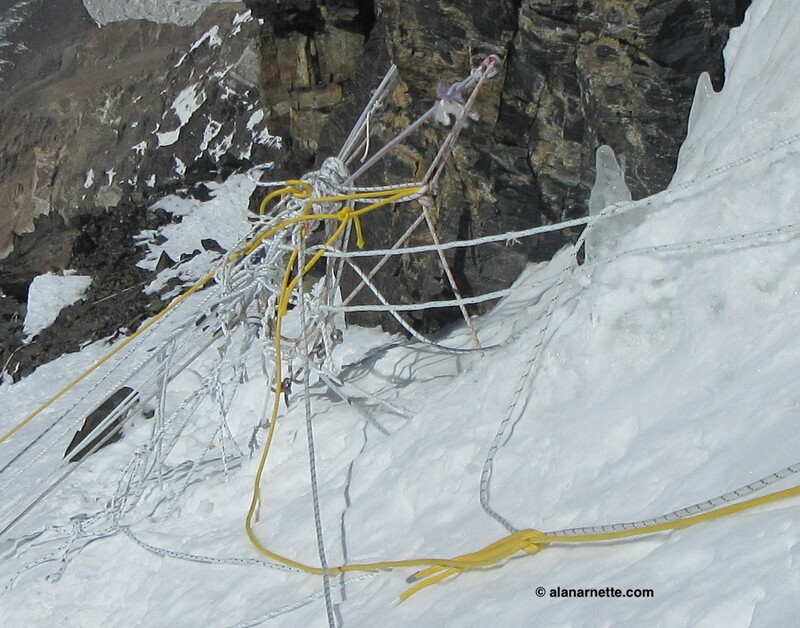 The rest of the misfortune was brought by the blizzard (in 1996) and falling of hard ice from the serac (in 2008) which broke and removed the fixed ropes. And who could forget the altercation and subsequent assault in 2013 when Ueli Steck, Jonathan Griffith and Simone Moro were attacked by upto 100 sherpas, at the Everest, basecamp over the issue of ropes fixed for the guided expeditions which was said to have been used by the trio without permission. Thank you, Alan, for the instructive information. Appreciated. In your video, the old ropes look good, but UV and wear are not always obvious. Why don’t the old ropes get cut down when the new ropes are fixed? It’s complicated. The last party needs the ropes but often lacks the strength to cut them and carry them down. When I was there in 2014, a unified Pakistani and Italian team brought down tons during their acclimatization rotations. Sorry to say but leaving fixed ropes on these peaks is somewhat common.